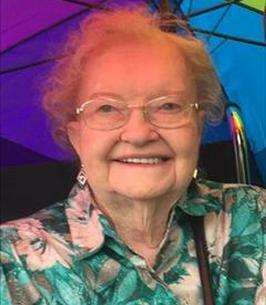 Theda Joyce Parks Williams, age 89, passed away peacefully at her home Saturday, October 13, 2018, in Stillwater, OK. Graveside Services and burial will be on her 90th birthday, at 10:30 a.m. on Thursday October 18, 2018, in the Fairlawn Cemetery in Stillwater, OK. Strode Funeral Home is in charge of the arrangements. Mrs. Parks Williams was born October 18, 1928, in Lincoln County, near Prague, OK. She is the daughter of Bill and Ada Schafer Brimm. She graduated from Centerview High School in 1945 and worked at Tinker Field Air Force Base until her marriage to Olie Olonzo (Lonnie) Parks on June 2, 1947. The couple had 9 children. Lonnie preceded her in death in 1974. She married Wayne Williams in 1976. Wayne preceded her in death in 1982. Mrs. Williams was a local seamstress and also provided daycare. She loved music and dancing, and always enjoyed a bargain. Garage sales will miss her. She loved Stillwater and believed it was the best place for her children to grow up. She was preceded in death by her parents; both husbands; two brothers, Don and Larry Brimm, both of Harrah, OK; and her oldest son, Lonnie, Jr.
She is survived by her brother, Cecil Brimm of Byars, OK; 8 children, Shirley Amen, husband Dan, Stillwater, OK; Beverly Porter, husband Terry, Stillwater, OK; Patricia Dooley, husband Terry, Denton, TX; Larry Parks, Stillwater, OK; Kenny Parks, wife Cindy, Duncan, OK; Randy Parks, wife Debbie, Carrollton, TX; Peggy Lambert, husband Ed, Broken Arrow, OK; Kelly Urias, husband Chuck, Coppell, TX; 17 grandchildren; 19 great grandchildren; and several nieces and nephews. To send flowers to the family of Theda Joyce Williams, please visit our Heartfelt Sympathies Store. We encourage you to share any memorable photos or stories about Theda. All tributes placed on and purchased through this memorial website will remain on in perpetuity for future generations. Our Condolences to Peggy and all her family on the loss of your mother.